An opening move in chess that sacrifices a pawn in the hopes of saving more valuable assets is called a gambit. Amazon’s Jeff Bezos plays it like a grandmaster. 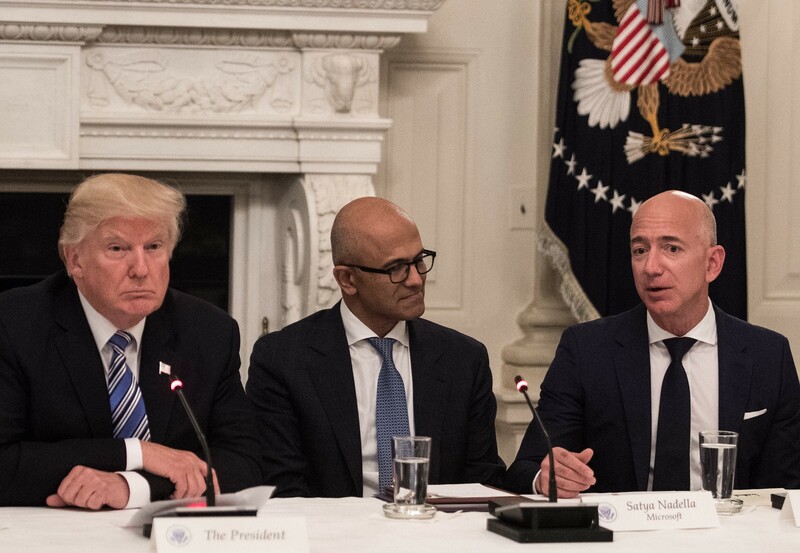 In recent weeks, President Donald Trump has publicly criticized Amazon more than five times over tax issues and his ownership of the Washington Post. The timely barrage ended Amazon’s stock market winning streak with a loss of more than 8 percent in the company’s shares. But Bezos is holding pat and biding his time, as did the CEOs of Boeing, Lockheed Martin, and even the New York Times, all companies that have seen their share prices skyrocket after the president’s Twitter attacks fizzled. The curious thing is why Bezos is so restrained, given his notorious reputation for volcanic outbursts. His patience would be summed up by a mixologist as one shot of Mark Twain (“don’t get into a letter writing contest with people that buy ink by the barrel”) and one shot of Warren Buffett. Through their mutual friendship with fellow Seattleite, Bill Gates, Buffett has gotten to know and like Bezos, and found him to be someone he could to business with — culminating in a joint venture with JP Morgan Chase’s Jamie Dimon on a new public healthcare company. But Buffett taught Bezos something he learned over many yeas, that patient capital and patient temperament go hand in hand. When Buffett gets attacked, whether by a trading scandal at Salomon Brothers or insider wheeling and dealing by a Berkshire senior officer, he analyzes the betting, waits for the right moment and attacks when the odds are in his favor. For Bezos that time will come. It begs the question, what is Trump thinking? Those who know him say he can be a loyal friend but has a dark side that can be vicious. He likes to go after big players like Bezos, just as he has attacked the media or Wall Street, and then does an about face and cuts a deal. Bezos knows this. But he also knows Trump will eventually tire of gnawing on the Amazon bone and may even come to appreciate the value of making friends with one of the world’s richest people, and the stock will recover. Then, in 2020, there will be an election — and that may be about the time the moment for reprisal presents itself.